Occupational health is intrinsically linked to good performance and work life balance. The Crossrail occupational health and wellbeing strategy has been developed to incorporate a four-cornerstone model on which to build a sustainable improvement on health and wellbeing, through greater understanding, informed decision-making and engagement with our delivery partners and contractors to promote the philosophy of optimal health for all staff. This case study considers the logic behind Crossrail’s strategy and improvement plan, the arrangements that were put into place programme-wide and how performance was measured and monitored. Health at work in the construction industry has primarily focused on compliance with health and safety risk management and fitness for work standards, without the recognition of the long term, cumulative affect of work on health, or the effect the fluctuating nature of the health of its staff has on productivity. Operating on 23 sites across central London, Crossrail decided it would take a strategic approach to the management of health and wellbeing at work, to benefit not only the 10,000 plus people who worked on the project, but also the industry as a whole. Crossrail developed four project-wide occupational health and wellbeing initiatives; air quality, fatigue, mental health and wellbeing. Occupational health is a complex function, which aims to minimise the impact of ill health on people and the organisations they work for, and to promote optimal health through evidence-based practice. The reduction in work related fatalities in the Construction industry in the past 10 years has been significant, in part due to focused efforts in reducing workplace accidents. However, construction workers in the UK were at least 100 times more likely to die from an occupational disease than from an accident. 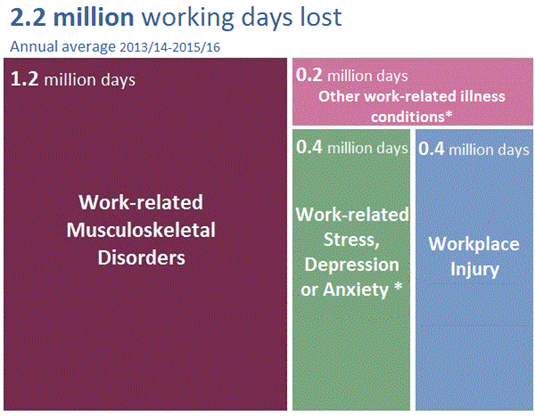 With work related ill health, Including; mental health, musculoskeletal disorders and respiratory conditions accounting for 2.2 million days lost . Mental health conditions alone (stress, depression and anxiety) account for 37% of all new and long-standing cases of work related ill health. 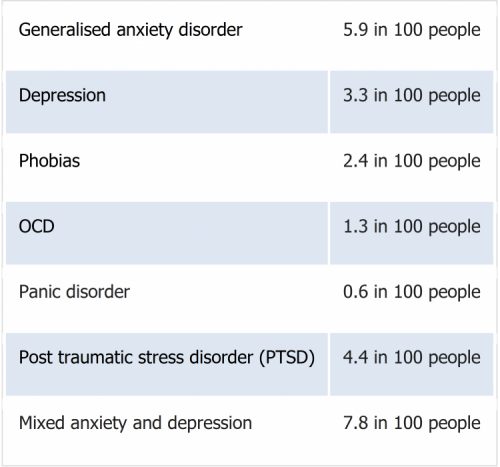 According to the Mental Health organisation MIND, though the overall number of people with mental health conditions has not changed significantly in recent years, with approximately 1 in 4 people in the UK experiencing a mental health problem each year, how people cope is getting worse in terms of self harm and suicide. Table 1 below outlines the most recent statistics. In order to address ill health at work a strategic focus is required to determine the needs of the people, the organisation and the interaction between both. 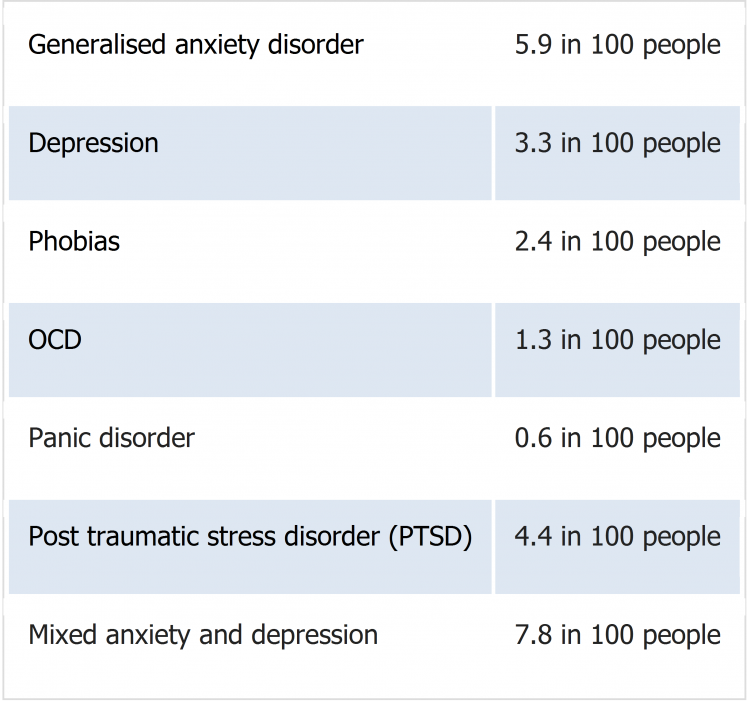 As the table above highlights health and wellbeing has to deal with risks in the workplace but should also include, understand and deal with the mental health issues that can affect the workforce. At Crossrail an OH&W strategy was developed in 2013, which set out the vision for health protection and promotion and was based on a set of minimal requirements. The strategy was developed with Principal Contractors (PC), to agree a baseline for good occupational health standards across the project. Some key occupational health (OH) risks were also identified, which led to a series of research projects on air quality and fatigue being commissioned. By 2014 contractors were achieving the minimal requirements as standard practice across the project and hence, Crossrail instigated a review of the strategy to develop a model that went beyond minimal requirements to good practice. The review was undertaken through engagement activities such as; the audit process, the occupational health forum and the Crossrail Safety and Health Leadership Team meetings. Outcomes of the review lead to Crossrail updating their bespoke health and safety performance index (HSPI), with one pillar focusing on occupational health and wellbeing. A new OH strategy was also developed predicated on a move away from the traditional focus on health assessment and physical wellbeing, to a strategy based on health needs, from the top to the bottom of the organisation. The outcome resulted in the production of a set of OH&W Principles and the Four Corner Stone model as shown in figure 2 below. Being an advocate and leader in Workplace Health. Engaging the interest of everyone involved in the project. Ensuring workplaces are designed to prevent workers health being affected. Protecting workers in their employment from risks, which may be adverse to their health. Reduce work related illness absence and increase support and rehabilitate workers. 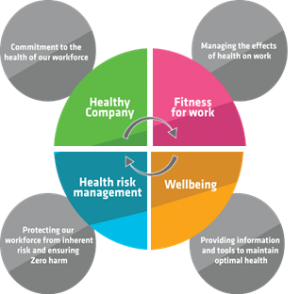 The four cornerstone model was a consciously developed model to simplify the provision of occupational health, helping leaders and managers throughout the business to articulate the overarching model for improved health and wellbeing. To be a healthy company Crossrail needed a strong and visible leadership, engaged managers at all levels, robust management systems and proactive performance management. · Thompson, S., Aked, J., Marks, N. & Cordon, C. (2008). Five Ways to Wellbeing: The Evidence. To meet the challenges to deliver the Crossrail programme safely, on schedule and within budget, Crossrail needed a workforce that was fit to meet the requirements of their role. The health status of the workforce was needed before placing them in their role and determining if any adjustments were required to accommodate them. Staff and contractors were also likely to experience ill health from time to time, have a pre-existing health/medical condition or adopt unhealthy lifestyle choices, all of which would have an impact on their fitness for work and needed managing. In 2016 the HSE stated that the management of health risks had not kept pace with safety, even on larger work sites. The estimated new cases of self-reported work-related illness in 2014, amongst people who worked, had increased back to the levels seen in 2009/10 . Crossrail’s activities were likely to create health hazards across all risk groups: physical, chemical, ergonomic, biological and psychological, having the potential to cause work- related ill health, and so there was a need for dynamic risk management. 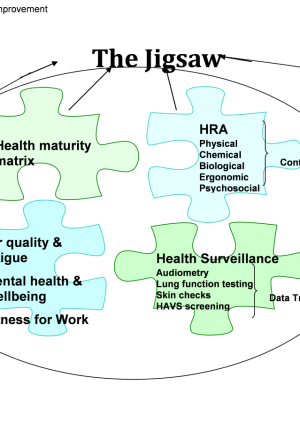 Providing health surveillance, as indicated by health risk assessment, at an individual, site and programme level i.e. lung function testing for grout operators, skin checks for bricklayers and audiometry for steel erectors. Wellbeing is a core influencer on people’s ability to perform effectively, efficiently, safely and with creativity to drive innovation. To achieve this cornerstone it was important to ensure the workforce had the psychological strength,(with regard to work this would be able to deal with for example stress, isolation issues), and mental health, (conditions and psychosis not related to work, that could impact), to think clearly. The workforce should be able to react safely no matter the pressure faced. It is this, together with the physical health and fitness that enables the workforce to come to, and perform, at work. Improving understanding of occupational health and wellbeing and developing a culture of wellbeing – by regular toolbox talks, site notice board displays and stepping up events. Crossrail and its Principal Contractors encouraged the workforce to take responsibility for improving their own health by providing the support, tools and opportunity needed to make healthy choices. The Health and Wellbeing Safety Specialist collaborating with the Principal Contractors to provide appropriate guidance based on National campaigns and relevant research. This provided direction to the workforce to allow them to make informed decisions about their own health and wellbeing. To move Crossrail and its Principal Contractors from a traditional to a more contemporary occupational health and wellbeing function, planning was needed. A template was developed to help structure the improvements around the four cornerstones. However, sites were given flexibility to help them align the Crossrail improvement plans with their parent company requirements. The plan was aligned to the overarching strategy but also incorporated the flexibility that was required to meet the health needs of the project as a whole and the individual sites, capturing data from a number of systems as outlined in figure 3 below. Crossrail developed four project-wide occupational health and wellbeing initiatives; air quality, fatigue, mental health and wellbeing. The first three initiatives have been detailed in associated Learning Legacy resources so the focus on the remainder of this document is on wellbeing. The Wellbeing Programme was a continuous improvement programme that went beyond lifestyle risk factors to create a wider picture of wellbeing at work, with a clear definition, greater visibility, local delivery, skills development, resources and governance. The programme was led by Crossrail’s external wellbeing consultants and implemented via the Wellbeing Champions and Mental Health First Aiders. A wellbeing programme was developed and all the activity associated with the planned actions to be carried out by the identified champion network. · Used regularly – induction, wellbeing board etc. · Storytelling – Encouraged people on site who have a personal story or interest in wellbeing to share that story. · Sent wellbeing message out to people locally using posters, leaflets, lunch and learn sessions, team meeting slots, intranet and blog. · Used audit programme to reinforce standards and expectations locally. · Increased local awareness/usage of available resources by mapping relevant tools to local calendar of activities. Building effective relationships allows for greater understanding and commitment to the desired outcomes of the occupational health and wellbeing strategy. Moving from a transactional approach that uses power and influence over the team or the task to succeed, to occupational health and into a more transformational approach of shared vision and creating motivation and clear direction for the teams/stakeholders. Crossrail’s Health & Safety Committee – chaired by the Chief Executive Officer in the presence of the Chairman and other Board members and other senior directors, ensuring that the occupational health strategy delivered to agreed expectations and that resources were used efficiently and effectively. This committee approved the strategy and plan and endorsed the key projects on air quality, fatigue management and mental health & wellbeing. Quarterly updates on progress and performance were given, and feedback received and incorporated into reports. The focus was on strategic objectives, and support at this level ensured a key focus on OH&W throughout the organisation. Safety and Health Leadership Team (SHELT) – chaired the Crossrail Health & Safety Director and attended by the Health & Safety Directors from the Principal Contractor and Crossrail senior management. This team met on a monthly basis to review health and safety performance, to share good practice and provide direction in terms of initiatives. The focus was on sense checking and supporting the health and safety plans. It also made contractors aware and provided engagement at a senior level which was invaluable for delivery of the strategy across the whole project. Project Managers Forum – there were a number of Project Managers forums for each of the main project activities and period presentations were given to share good practice and project wide health initiatives. The focus was on the management of health & safety on site and these ensured OH&W initiatives and feedback were shared right across the project. PC Health and Safety Forum – chaired by a Crossrail health and safety adviser and attended by the health and safety advisers from the Principal Contractors on each site and Crossrail health and safety advisers. This was the main forum for sharing information, clarifying expectations, discussing how to deliver performance and initiatives and challenging any misconceptions. The focus of this forum was on delivering site-base activities and performance. Crossrail H&S team – consisting of the improvements team, audit team and systems team. The team focused on developing and managing project wide systems, initiatives, data, assurance and performance. Crossrail developed its health and safety performance index (HSPI), with one pillar focusing on occupational health and wellbeing in order to align with the new strategy. Originally the HSPI consisted of a number of measures to address concerns in compliance with contractual requirements, as indicated by previous audits that were conducted on each of the sites but this extended it to include a focus on contractor performance on OH&W. As part of the OH&W strategy review an OH&W Maturity Matrix <latest version to be uploaded> was developed to articulate 15 elements of good health management at work and to measure improvement from a general ‘awareness’ level, through ‘committed’ to ‘established’ and onto the ‘enhanced’ level. 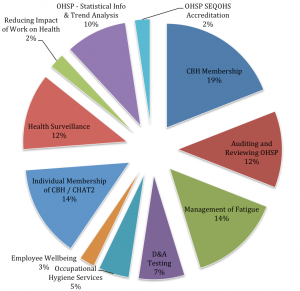 The matrix was adopted as the only HSPI measure for occupational health and wellbeing and was developed so that the ‘committed’ level was aligned to the contractual requirements for occupational health. As the audits had identified a number of gaps in knowledge about occupational health good practice, the Health and Safety Advisers on each of the Principal Contractors sites completed the matrix in consultation with the Crossrail OH Specialist. A readiness checklist was provided to help prepare for the evaluation, as well as a number of tools such as; a health risk assessment, clinical audit protocol and health & wellbeing plan . Each year the OH&W maturity matrix was used as the key performance indicator, with a target set across all sites to reach a HSPI Score of 2. Each site was required to demonstrate progress by use of a RAG (red, amber, green) score on a uarterly basis. This resulted in significant improvement over the first year. Tables 4 and 5 show the level of improvement by contract. A new target was set in April 2017 to improve performance to the end of the project and includes the requirement of an occupational health and wellbeing improvement plan. The Crossrail Health and Safety Advisers were briefed on the matrix and how to assess progress, in collaboration with the Principal Contractors Health and Safety Advisers in order to develop the plan. The success of the occupational health strategy has been partly due to the ability to simplify a complex topic. It was possible for senior leaders and advisers to understand the business case commit to the long term effectiveness of the programme, to communicate requirements, track progress and therefore care for the workforce. Ensuring that the management systems, improvement programme and performance were all linked to the strategy helped to improve the occupational health and wellbeing maturity of Crossrail, its Partners and Principal Contactors. 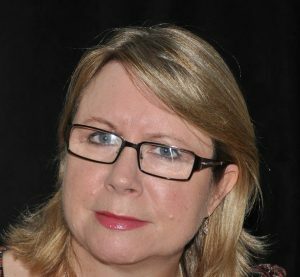 Project managers and health and safety advisers have competing priorities and it is understandable that the short-term benefits of managing safety are tangible but sometimes at the cost of the long-term benefits from the promotion and protection of health. Communication at a management level is as important as that at a strategic level and more OH Specialist resource was needed to work more at an operational level. The Occupational Health forum was a standalone forum that was integrated into the health and safety forum and though there was time allocated to health initiatives it was transactional in nature and did not include all of the previously invited Occupational Health Service Providers, who could help drive change at the sites. Measuring the success of occupational health was possible through the use of the maturity matrix, but the lack of consistency in the improvement planning meant that those initiatives that needed a long-term commitment to change were not always being considered at site level and adjustments were being made, rather than a complete review being conducted to change the way of working. For example; making changes to shift patterns, rather than implementing a fatigue management programme that looks at the person, the work and the environment in which they live and work. 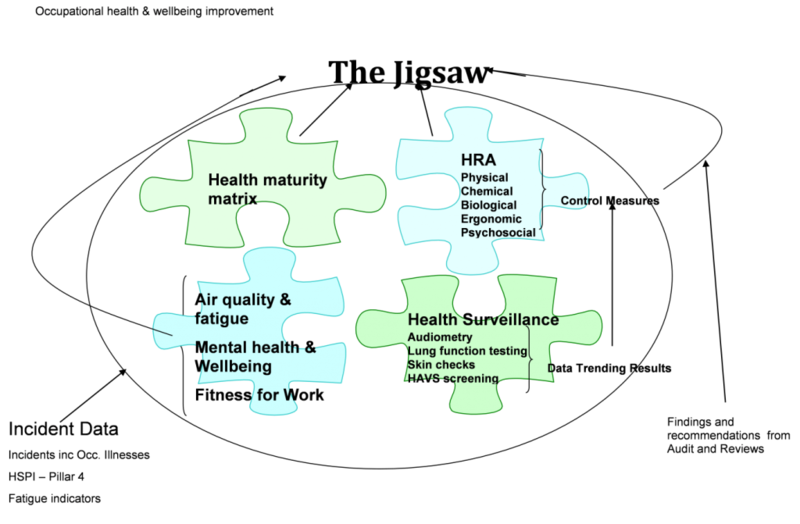 The OH&W Maturity matrix was linked to performance, which in turn was linked to the recognition programme. This resulted in a drive for quantity over quality, expectations of quick results and reaching targets in short succession. This is a contradiction to what is expected in terms of sustainable improvement in health management; the embedding of knowledge, tangible improvement in physical and mental health and improvement in personal performance. Management commitment to mental health and wellbeing was good, with the establishment of the wellbeing champion network and mental health first aider team. Effective leadership through an occupational health strategy that aligns with the needs of the organisation and its workforce and the ability to articulate this is terms that can be understood by all. Employment of an occupational health professional specialist with the depth of knowledge, experience and behaviours required to lead the occupational health and wellbeing strategy and performance. Dedicated resources required to raise the profile of occupational health, to implement the improvement programme and to measure and monitor health performance. The resources required are an in-house occupational health advisers on all sites, a budget to deliver the improvement programme and time to implement the initiatives and act on feedback. Treat health like safety by recognising that the model used to manage health is very different to that of safety as the impact in neither visible nor short term, it is more than the activities that people do at work, and it is an integration of health and work with people at the centre. Physical, mental and psychosocial. Wellbeing Champions and Mental Health First Aiders – There was a good level of commitment by the management team, the next step would be to have the roles of wellbeing champion and mental health first aider recognised so that a development programme could be established and time given for the individuals to spend time on these roles and more focus given to some of the programme wide initiatives such as ‘Build Your Energy’ and ‘Good Day at Work Pledge’. In conclusion the overall strategic intent should be to Manage for today and lead for the future by having an occupational health strategy and planned programme that has a mix of short term and long term objectives, which are measured in terms of their effectiveness on the individual and business success. Hafner, M, Stepanek, M, Taylor, J, Troxel W.M and van Stolk, C (2016). Why sleep matters – the economic cost of insufficient sleep. Rand Europe.